UNITED STATES: Dominion Energy Virginia is continuing the development of its Virgina offshore wind project, but with Dong Energy now acting as a strategic partner and contractor. Dominion remains the sole owner of the project, formerly known as the Virginia Offshore Wind Technology Advancement Project (VOWTAP) but now named Coastal Virginia Offshore Wind project. VOWTAP was shelved "indefinitely" in September 2016, after it was deemed too expensive. The two companies said following the strategic partnership deal, the negotiations will move on to "refining agreements for engineering, procurement and construction". Dong will advance the engineering and development work of the project, Dominion said. Two 6MW turbines – as with the original VOWTAP plans – are still due to be installed at the demonstration project by the end of 2020. 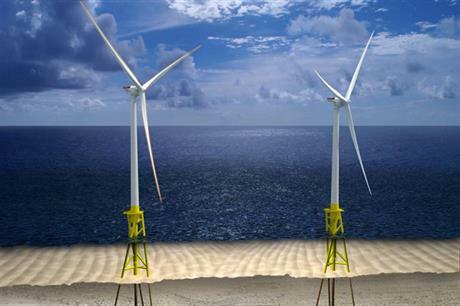 "This project will provide us vital experience in constructing an offshore wind project in the United States and serve as a stepping stone to a larger commercial-scale partnership between our companies in the future," said Dong's wind power CEO, Samuel Leupold. Dong owns the licences to two 1GW zones off the US' east coast in Massachusetts and New Jersey. "We see the tremendous potential in the Mid Atlantic for emission-free, renewable wind generation and we are excited to help [Virginia] in reaping the benefits of wind power," Leupold added. The 12MW pilot project will feed information in to Dominion's larger offshore wind zone, which could host up to 2GW of offshore wind, the utility said. As part of the agreement, Dong has the exclusive rights to discuss continued partnership in developing the commercial site, following the completion of the pilot. "While we have faced many technological challenges and even more doubters as we advanced this project, we have been steadfast in our commitment to our customers and the communities we serve," said Dominion CEO Thomas Farrell II. Dominion had been awarded a $4 million advanced technology offshore demonstration grant by the US Department of Energy (DOE) in December 2012 and another $47 million of DOE funding in May 2014 to support the 12MW VOWTAP. But in May 2016, VOWTAP was dropped from the DOE programme after failing to meet funding milestones. VOWTAP was due to be installed 41km off Virginia in 25-metre deep waters. It was to be a hurricane-resilient design, with US-designed twisted-jacket foundations and GE Haliade 6MW turbines.